Yorkies can be divided into three categories on the basis of health problems which are inherited, acquired, and congenital. 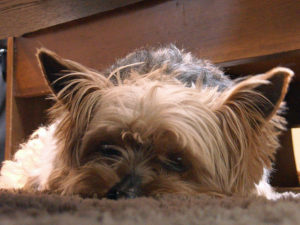 If parents have any genetic disease then there are chances that the little Yorkie will not be completely healthy. It is important for the owners to get familiar with the diseases so they will be able to notice the symptoms of the disease at the early stage and start the treatment of the disease. Generally, little Yorkies between the birth and the fourth month get affected with this disease. In the first few months, the owner should take special care of the puppy as it is the most critical time period. Some adult dogs also get affected by the disease because of various health issues, i.e. pregnancy complications, liver disease, etc. Hypoglycemia is the disease in which blood sugar level drops in a fast manner. It badly affects the brain and motor skills. Its symptoms include weakness, tremors, drowsiness, depression, and coma. It is the disease of the hip joint. It occurs when the hip bones are not able to get enough blood supply. Little Yorkies that are around five to eight month old get affected with this disease. The symptoms of the disease are leg going lame, pain, limping. In this disease, the retina of the Yorkie has an irregularity. It is an inherited disease of this breed. Some owners are unable to identify this disease as the dogs have an amazing sense of hearing and smell. It is necessary to take the regular examination of your dog on a yearly basis. Luxating Patella is loose of the hold of the kneecap. There are few symptoms of this disease such as if you realize that your puppy is in pain and unable to bend the leg then don’t ignore it and identify the problem with the help of X-ray and ultrasound.